I made this pasta salad for the neighbors' get together over the weekend. I had never added avocado to pasta salad, but I did this time. I had an extra avocado left over from making guacamole, so I decided to add it the pasta salad at the last minute. Of course, I gave the avocado a good squeeze of lime juice. I don't know why I never thought of adding the avocado before. The avocado added a creamy goodness to the pasta salad, in addition to the tomatoes, black olives, and feta cheese, and it was so good and healthy. You know that pasta salad is to easy to change up the ingredients by varying the pastas, cheeses, veggies, and dressings, but you must try the avocado, and don't forget the lime! Enjoy! Earlier in the week, the widower of my friend, Pam, who passed away from a brain tumor in 2003, suddenly passed away, Paul was 60 and just been diagnosed with cancer. Here are two lives cut too short from cancer. Their two daughters, who are adults, with families of their own, have lost both parents way too soon. Hug the people that you love and appreciate, because, life is short. Make the most of every day! Combine all of the above ingredients in a large bowl, except for the avocado and lime juice. Toss the pasta salad with the dressing. Right before serving add the avocado and lime juice .May be served chill or room temperature. Combine all ingredients in a quart jar and shake well or whisk in a large bowl, and pour over the pasta salad. This looks fantastic. I adore avocado in anything like this. And, I'm a black olive fan too. Thanks for sharing the recipe. I'm so sorry about your friend and the loss of now two people. I will give Dudette and Hubby big hugs. Christiane-Thank you for your kind words and condolences. Life is short, and we never know what is around the corner. I'm so sorry about your friends. I'm hearing this way too often and don't like it. I haven't tried pasta this way, but it's on the must try soon list. I love black olives, but can't get the hubs or kids to try them. So they will be all mine, he, he. Hoping all else is well with you. Gina- thank you for your condolences. We have to find a cure for cancer! Your pasta salad looks fabulous...the avocado is a delicious addition and I love that you've dressed it with a vinaigrette.....mmmmmm. Lizzy-Yes, my friends are together, but I feel so bad for their daughters, who have now lost both parents to cancer. This Pasta salad is so good with the avocado and vinaigrette dressing. Avocado and feta do sound like a tasty combo-yum! I am always up for a new pasta recipe and this one does look like a keeper. Sorry to hear about the loss of those two, another sad reminder that life is fleeting. The daughters are in my prayers. Tina-Thank you for your condolences. They are greatly appreciated. 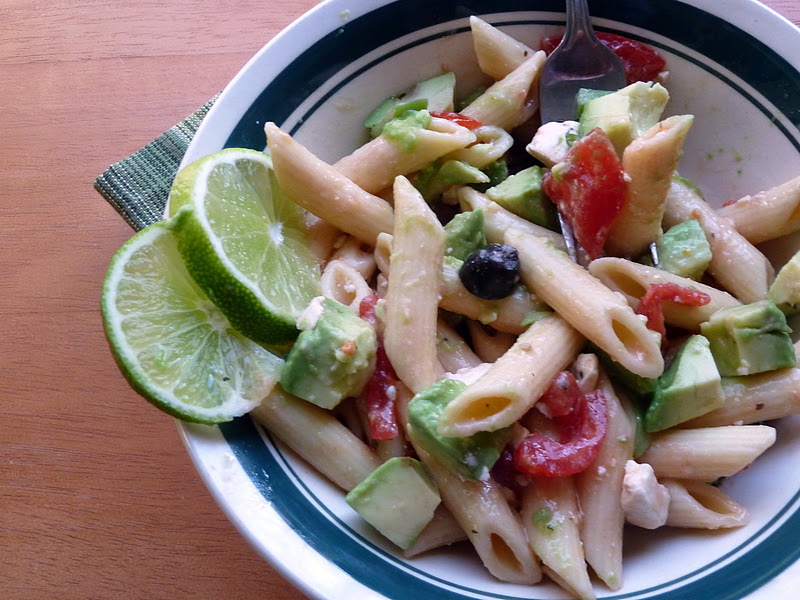 This pasta salad is good with the feta avocado combo. Me agrada esta pasta fresca sobre todo que hoy hacen 33 grados ,una ensalasa saludable y elegante,abrazos hugs,hugs. Thank you for stopping by my blog. I hope that you like what you see. I'm sorry about your friend Becky. Thinking of you both!